The replacement of Anatoly Serdukov by Sergei Shoigu has not meant a retreat from the modernization of the Russian armed forces. On the eve of Feb. 23, Defender of the Fatherland Day, Russian Defense Minister General Sergei Shoigu alerted the Ivanovo Airborne Division, based about 180 miles from Moscow, to take a trip to the Urals. In a matter of hours, 7,000 soldiers marched to the airport, where 20 Il-776MD military transport aircraft were waiting. They loaded up the planes with combat cargo, and departed for Chelyabinsk where, along with other troops and units stationed in the district, they are to undertake tactical exercises with live ammunition from all standard-issue weapons at the Chebarkul range. This is the first such sudden readiness inspection of an entire division to be carried out in the Russian Army for two decades. In all previous cases, advance warning of tactical and operational-tactical drills was given. The live-fire exercises are intended to determine the success of the intensive combat training regime and reforms that were initiated under the previous military leadership. 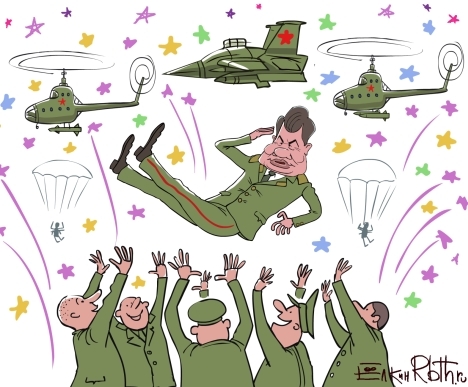 The dismissal of Defense Minister Anatoly Serdukov last November and his replacement with former Emergency Situations Minister and Moscow Region Governor Sergei Shoigu raised many questions both inside and outside Russia. Chief among these was in which direction Shoigu might take the Russian armed forces and whether he would continue the reforms begun under Serdukov. So far, Shoigu has opted to continue the reform process, which so far has involved a structural transformation of the Russian Army into four military districts – West, South, Center and East – and a restructuring of the chain of command into a district-army-brigade system. Shoigu has also retained the combined arms brigades created on top of motorized infantry and tank divisions, and did not transfer the Navy General Staff and Cabinet back to Moscow from St. Petersburg, although he did give more powers to commanders-in-chief of the Armed Forces and corps commanders, including matters pertaining to subordinate personnel and institutes. The principle behind the decision is a simple one: commanders know best what they need. New combat equipment and weapons continue to be delivered. The Yuri Dolgoruky nuclear submarine armed with Bulava strategic missiles is now in service; the analog Alexander Nevsky is undergoing testing; a third underwater cruiser, the Vladimir Monomakh, has been launched; a fourth, the Nikolai Krestitel, is at the launch site, and a fifth and sixth, the Alexander Suvorov and Mikhail Kutuzov, will follow. The Ivanovskaya and Tatischevskaya strategic missile troop divisions have been transferred to new strategic sites, with a further three divisions — Tagilskaya, Kozelskaya, and Novosibirskaya — set to follow. In 2013, the new Armata heavy combat platform for tanks will be tested, followed by the Kurganets medium combat platform for amored personnel carriers, and the Boomerang light combat platform. Under Shoigu’s orders, 1175 Russian-made Tiger armored cars will be purchased to replace the Italian-made Iveco, but the procurement of two French-built Mistral helicopter carriers will go ahead. Shoigu has also not turned his back on the outsourcing introduced by the former defense minister and severely criticized by some military experts. Under the outsourcing contracts, civilians will be employed at military kitchen and cleaning facilities, however they will cease to clean army barracks — soldiers themselves must now take care of the cleanliness of their accommodations. Measures are still ongoing to “humanize” military service. As before, conscripts will be allowed to take an hour’s nap in the afternoon, go on leave on Saturday and Sunday, and call friends and family by cell phone in off-duty hours. Shoigu has ordered the construction of additional shower rooms so that soldiers can wash whenever they want, particularly during the weekly banya. Moreover, soldiers will have buffet meals with more vegetables, and there is a plan to design more comfortable uniforms. Shoigu has also introduced a monthly public conference call. On a big screen at the Central Command Post of the General Staff, all commanders report in turn to the defense minister on the implementation of previous orders, and receive new instructions and sometimes an earful of criticism. Journalists are also invited to observe the proceedings. Shoigu is also making his presence felt in the field of military education. The closure of a number of military academies and institutes has been put on hold and two-year military training programs have replaced the 10 month program favored by Serdukov. Additionally, parade drills have been reintroduced at the Suvorov military academies to discipline future officers. The problem of accommodation for retired service personnel – who are guaranteed housing by the state – has also been solved. Shoigu has demanded that Moscow apartments be allocated to those officers who have won a court judgment for housing against the Ministry of Defense, but have yet to receive an apartment. As of Jan. 1, more than 33,400 people were waiting for housing, and an additional 22,000 personnel transferred to the reserve in recent months were all pledged an apartment by end 2013. Starting Jan. 1, 2014, rather than receiving keys to an apartment, discharged officers will instead receive a lump-sum payment to use to purchase their own accommodation. The amount will depend on the number of family members, length of service, and military rank, but the price per square meter will match that of an average apartment in the relevant category. While Shoigu is putting his own stamp on the reform of the Russian military, overall the process is moving forward rather than retreating from the progress made up to this point.